AmRest Holdings SE (AmRest, WSE: EAT) is the largest independent restaurant operator in Central and Eastern Europe with a growing international presence. Since 1993 company has been building a portfolio of well recognized, power brands such as KFC, Pizza Hut, Burger King and Starbucks based on solid franchise and joint venture partnerships. AmRest owns the La Tagliatella brand which is being developed internationally as both Company operated restaurants and franchised stores. Recently AmRest acquired two unique brands operating in China - Blue Frog and Kabb and also opened Stubb’s first restaurant based on a joint venture agreement. 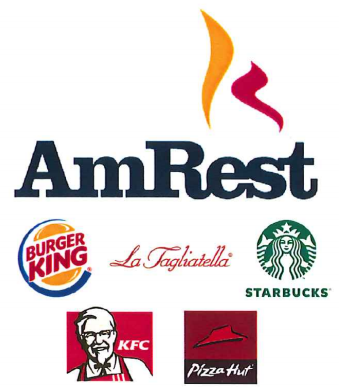 Today, AmRest operates over 720 category leading Quick Service and Casual Dining restaurants. Through our "Everything is Possible" culture, every day over 18 thousand AmRest employees in 13 countries deliver delicious food and exceptional service at affordable prices. AmRest made a decision to implement workflow solution. Assumption has been made to spend 80% the time on choosing the right system, and only 20% on its implementation. The process of evaluating different workflow systems took almost one year. 12 systems from different European countries were compared. AMODIT immediately made good impression because of the flexibility of both the system and its supplier (ASTRAFOX). The only doubts were connected with fact that it is a new product on the market, but AmRest is not afraid to make bold business decisions. The main argument for choosing AMODIT is his philosophy, which allows an easy and inexpensive way to provide a large benefit to the business in the form of an integrated workflow and DMS solution. It does not require a multiday analysis nor mandays of consultants and thus it is well received by the business departments. comprehensive implementation of processes for restaurants and office in one tool. Lemon Pro became AMODIT partner. The company specializes in the overall management of IT environments and systems integration. It provides consulting, design and implementation of new technologies, as well as maintenance and management of enterprise IT environments. Astrafox was qualified in GO GLOBAL project in competition made by The National Centre for Research and Development in Poland. Project supports enterprises for commercialize results of science research on global markets. In this project we are going to do activities from January to June 2014 with AMODIT on US market. Project is partly financed by National Centre for Research and Development in Poland. How to make WebDAV work in read-write in Office? Click Start, click Run, type regedit in the Start search box, and then click OK. Type OpenDocumentsReadWriteWhileBrowsing, and then press ENTER. Right-click OpenDocumentsReadWriteWhileBrowsing, and then click Modify. On the File menu, click Exit to quit Registry Editor. Sales of AMODIT licences increased over 120% in 2013 (comparing to 2012). This success is supported by our partners. We hope to grow this business together! Javatech is specializing in IT courses, including BPM and SOA. From now on Javatech will include AMODIT in their courses. Thus participants will learn about our innovative approach to BPM.